Digital Marketing is the promotion of product and brands via electronic media. In today's tech world, digital marketing is one of the best options adopted by sellers for marketing of their products and services. Digital Marketing itself is a massive word as it has multiple techniques and strategies. As Digital Marketing changes regularly, many of the policies we trusted in the past may not be useful now. But which approach to adopt for the business's success is still a question to ponder for the businesspersons because the right type of strategy can, in turn, lead to higher sales, new customers, and long-term growth. Hence, as a market leader, one should always be trendy to put the brand in front of the right audience, on the right channel, at the right point. Looking forward, in this article, the writer has suggested ten new trends which are relevant for marketers across businesses of a range of sizes. Customer experience is already driving digital marketing. Facing a significant disruption of the industry, companies have to rethink their customer experience to remain attractive. Digital Marketing Companies in India are engaged in creating unique platforms to derive target customers like shorter contents, more personalized and instantaneous videos and graphics. In 2018, Digital Marketing Services like content marketing will only be what matters the most for marketers, in B2B or B2C businesses, with whatever organization or budget. The link between content's frequency of publication and the number of customer interactions confirms the urge to implement a customer-centric communication, focused learning material, disruptive and exploratory work. The goal of mass marketing is simple: collect the maximum customer behaviour data and analyze it with artificial intelligence algorithms and then develop customized targeting strategies. Big Data technologies, a service provided by the digital marketing agency, collect the massive amount of data from social networks, online purchases, mobile apps downloads and analyze it with artificial intelligence algorithm. Conversion Optimization Rate (CRO) – which means increasing the percentage of users converting into customers through the website – will grow further in 2018's marketing strategies. There are many digital marketing agencies in India that provide CRO service which is closely related to search engine optimization (SEO) and can double the gains. Cross-device targets consumers across multiple platforms or devices. It involves sending messaging and advertising to reach audiences when and where they are ready to engage with your brand. You can build a complete cross-channel profile of your consumers by understanding audience’s habits across devices that provide data to target them more efficiently. Only the expert digital marketing companies provide such services. Data is the heart of marketing. Marketers have to analyze customer’s micro-segments to get data. Connected objects, more and more integrated into our daily lives, are collecting more and more data. Digital marketing services include this Data-Driven Marketing service that can forecast bright objects which can interact with the customer more collaboratively to know their needs. 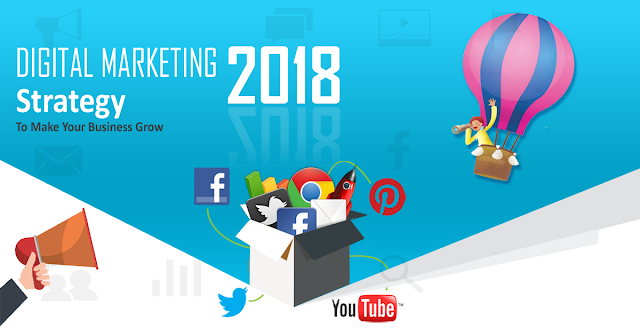 The proficient team of a Digital marketing company in Indore, CreativeClick, offers corporate blogging service which promises so many benefits like a market update, expert tip, news from the brand's perspective, optimize search, and convince customers. It provides a bridge to create a new relationship with the audience. 70% of customers learn about a company through its content, and corporate blogging can generate 67% more leads. Once the content is created, it should be addressed to the right audience, at the right time. To get efficiency and regularity in publications, digital marketing agencies are referring to automation tools to promote content through various channels like social networks, newsletters, emailing campaigns etc. 75% of B2B customers use social networks to decide to purchase. Sales teams can adapt their offer specifically to their prospects and accompany them on the entire thinking process. Digital marketing company provides LinkedIn Sales Navigator Integrated Solution, with its 450 million subscribers as LinkedIn is number one professional social networks and also the priority for social sellers. Chatbots are the perfect example of marketing automation solution impacting the business in 2018. These virtual assistants animated by artificial intelligence can bring customers their answers in real-time. The simplicity of installing this system on CMS convinced a lot of company to implement. Many new technologies are waiting to hit the market. Few can amaze with their prediction/innovations. Few can fail to create the allure as the technology, consumer need and trend may change. However, the techniques outlined here are likely to pass and set its pattern to drive the marketing strategies. CreativeClick is the best Digital Marketing Company in India providing digital marketing services like SEO, SMO, SMM, PPC, ORM & Email marketing with Graphic Design Services in India.